NASA and other space agencies around the world are preparing for the next International Space Apps Challenge. The International Space Apps Challenge is an international mass collaboration that takes place in cities around the world. The event embraces collaborative problem solving with a goal of producing relevant open-source solutions to advance space exploration missions and improve life on Earth. NASA is leading this global collaboration along with a number of additional government collaborators and local partner organizations. The Durban Innovation Hub has taken to hosting the first Space Apps Challenge Hackathon, a first for Durban. Click HERE to view official sign up site. We are extremely proud to announce to you all that we have officially partnered up with Amazon Web Services. They will be providing free credits at ALL of our upcoming HackaEvents. On the 15th‐16th of August 2014, HackaDurban hosted its first 24hr hackathon. The event was aimed at connecting the techpreneur community by combining enterpeneurship and technology to build start‐ups over 24hours. This was to build on the “Solutionism in Durban”. Participants took part in a diversity challenge where they were broken‐up into groups at random and asked to develop a concept over 5mins and later pitch it to the floor, this was in a bid to familiarise the participants with the overall objective of the Hackathon. One of the highlights of the events included The Game Crew who were the youngest participants of the hackathon, made up of Daryn van Vreden (14), Liam Henry (15) and Shane Constable (15). Their creative juices were flowing as their end product was a 3D, first‐person rendition of the classic Pacman game. Saturday was D‐Day for participants as they had to finalise on the technology elements of their minimal viable products and draft a small business model for pitching to a panel of judges at 3pm. First place went to Chariteez, for their creative use of branding in driving social awareness and responsibility. Second place went to, Project Hawk and Third place went to Danger. • Each team received a small cash prize sponsored by Ernst and Young Students UK. Jonathon Darker from Durban Digital Day. the Go Metro team for the development and eventual rollout of Go Metro in Durban. avenues for their development in the gaming arena in Durban. 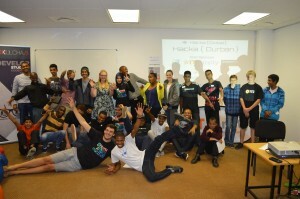 A hearty thank you to hackers, organisers, mentors, judges and sponsors of the HackaDurban Hackathon.